Last night, I had the honor of pretending to be a judge on Iron Chef. For all you fellow Food Network junkies, you can be jealous. Fire in the Triad is one of four regional dining competitions in North Carolina’s Competition Dining Series. The Triad’s edition follows Fire on the Rock, Fire on the Dock and Fire in the Triangle, pairing renowned chefs from Greensboro and Winston-Salem to battle it out in the kitchen. 6 courses + 1 secret ingredient = a very entertaining and filling evening. Each chef has a team of 3 sous chefs, and access to the same food truck. They must prepare 3 dishes each, using the secret ingredient. The diners do not know ahead of time which chef has prepared which dish. Tasters vote on their smart phones, and points are based on presentation, aroma, flavor, accompaniments, creativity and execution. As for the revealing of the secret ingredient, there was no lanky Asian man yelling “a la cuisine!” – instead, we were shown a very famous movie clip from “Fatal Attraction.” Movie buffs can already guess the secret ingredient: Rabbit. I was a rabbit virgin, but I will try anything once. I was thrilled. Our first course of the evening was prepared by Noble’s Grille chef John Bobby. I know how to pace myself at these things: if you like something, eat it. If you don’t like it, leave it alone. The problem was that I didn’t dislike any of the dishes! Wild Mushroom Agnolotti with Rabbit Sausage, Goat Cheese and House Made Ricotta, Braised Rabbit, Pickled Shallots and Carrot Nage was a wonderful introduction to rabbit. (Don’t worry – I didn’t know what half of the terms meant either, and I consider myself a foodie.) 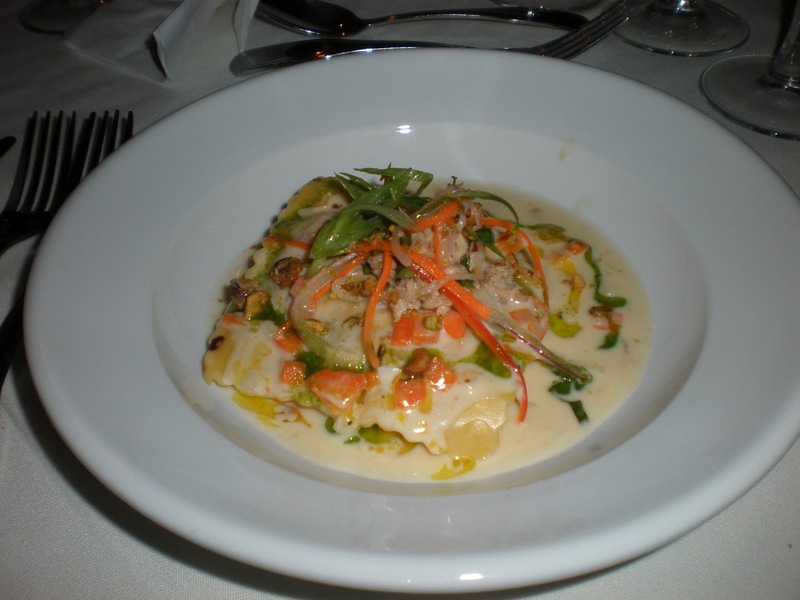 The familiar flavor of sausage and the tangy goat cheese filled agnolotti noodles, and provided a nice flavor balance to the sweet carrot sauce. Things were off to a very good start. The second course blew the first out of the water. Josephine’s Bistro's Chris Blackburn prepared House Made Rabbit Confit & Crawfish Raviolo, Pickled Summer Vegetables, Charred Pistachio, Coconut Masala Veloutte & House Made Ricotta. This was by far my favorite course of the night – one large, plump ravioli filled with tender rabbit meat, crawfish, floating in a sea of coconut sauce made for an incredibly unique and well-executed dish. The pistachios added a necessary crunch. This needs to be added to their year-round menu. 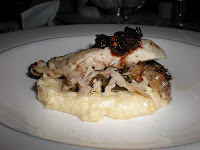 Noble’s won my vote for the entrée round, with Grilled Rabbit Loin, Old Mill of Guilford Stone Ground Grits, Rabbit Braised Collards, Cherry Mustarda, and Rabbit Jus. Three tender rabbit loin slices lay atop creamy, luscious gouda-enhanced grits, with a bite from the cherry mustarda and unfortunately an almost too-potent vinegar flavor from the braised collards. 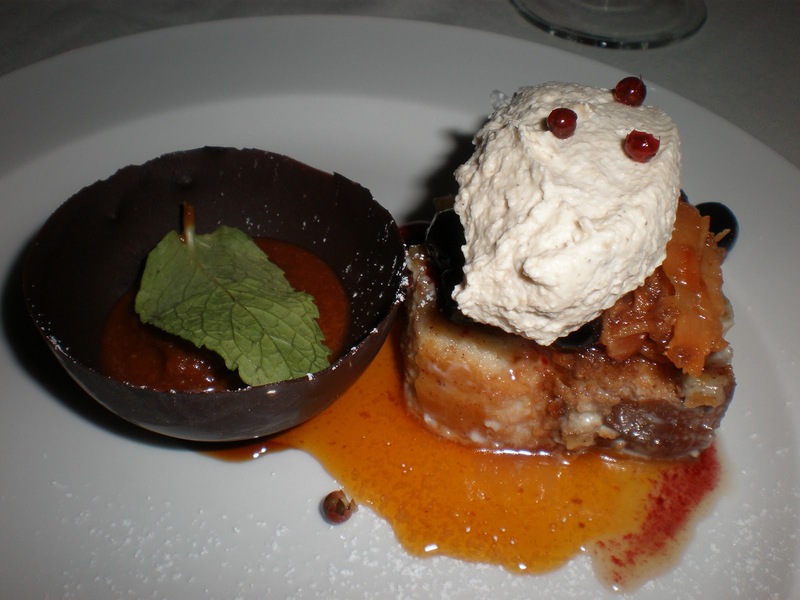 The chefs are told that dessert courses are not required, especially when the secret ingredient is a protein. They decided to accept the challenge. Half of Chef Bobby’s dessert was successful. Roasted Rabbit & Peach Glaze soaked through a Yellow Sponge Cake, topped with Diplomat Cream, served alongside Rabbit Jam and a Honey Cashew Tuile. 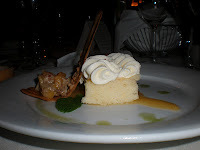 I could not detect the rabbit in the peach glaze, which is perhaps why I enjoyed the cake so much. The cream was superb. The Honey Cashew Tuile (cookie) was a delicate accompaniment, but the Rabbit Jam was unnecessary, and (apologies), when served cold, tasted like canned pet food. Not that I’ve ever tried that. As if that weren’t insane enough, Josephine’s tried their hand at a rabbit dessert, and in my opinion, failed miserably. Candied Leg of Rabbit sat atop Pan de Huevo, much like a bread pudding, topped with Smoked Sweet Tea Mousse, Pomegranate Molasses and Pink Peppercorn Blueberries. An RC Cola Mole Granita spiked with a ridiculous amount of cayenne was served in a chocolate bowl. These two thoughts did not merry well together at all, and I think they attempted entirely too much with all of the ingredients – pink peppercorns have a totally different type of heat than cayenne, and the RC Cola Mole Granita really hurt the flavors of the Smoked Sweet Tea Mousse. At this point, I was stuffed anyway, so I was somewhat glad to not have a mouth-watering temptation in front of me. An evening of adventurous food and good friends made this a very special treat. As for the winner, Josephine’s edged out Noble’s in the end. This event is open to the public, but I felt very privileged and grateful to be able to give my opinion and cannot wait for another opportunity like this.